One would have thought that with the petrol shock of the two-month Indian blockade, the government would get moving double quick on a campaign to introduce electric transport. After years of lobbying by energy activists, the Ministry of Physical Infrastructure and Transport had finally drafted the Environment-friendly Vehicle and Transport Policy last year. But, as with most previous plans promoting use of clean energy vehicles, it never got off the ground. What’s worse, there is no sense of urgency even with the current fuel crisis. On paper the policy looks great. It advocated the production and use of zero emission vehicles for public transport, establishing charging stations and infrastructure for electric vehicles, and conversion of petrol cars to electric. It also proposed setting up 11 electric charging stations with double feeders around Kathmandu’s Ring Road and establishing battery-recycling centres, plants to manufacture EV parts and developing better road infrastructure. No surprise that implementation has been nil. The Department of Transport Management says it is currently working on the guidelines for policy implementation but activists believe the delay is intentional: the government is dragging its feet due to pressure from powerful car dealers and revenue from taxes on vehicles and fuel. A review of various transport plans of the government over the years shows the same story: lots of promises on paper but zero result. The sixth, seventh and eighth five-year plan all mention expansion of trolley buses. The tenth five-year plan promotes the use of environmentally friendly and battery operated vehicles. Except cut the excise duty on electric vehicles, not much else has been done. Despite immense popularity, the government discontinued the trolley bus system in 2001 and formally shut it down in 2009. In 2005, the government refused to let Safa tempos run on more popular commuter routes and began actively promoting diesel private cars. The National Transport Policy of 2001-02 stated that electric vehicles and solar chargers would be ‘expanded throughout the country’. It also suggested that zero emission vehicles would be exempt from customs duty. 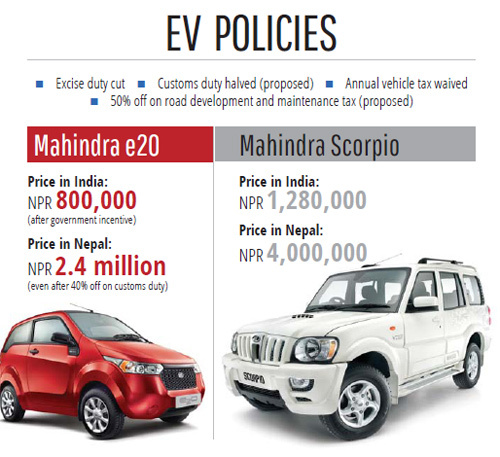 To be sure, the government also cut customs duty on electric vehicles by half in this year’s budget and zero emission cars are exempt from the Rs 30,000 road tax. The government charges one percent custom duty for import of SAFA Tempo's chassis, engines, motor, battery, and battery charger making it cheaper to import EVs rather than manufacture it in the country. In a recent interview with a national daily, the newly appointed Minister of Commerce Ganesh Man Pun said: "In the long term it is important to reduce consumption of imported fuel by developing hydro electricity on our own and promoting the use of electric vehicles." But gauging from the government's foot dragging response in implementing EV friendly policies, it may be a long time coming. "If we can generate enough electricity, going electric is not a far-fetched dream," says Shrestha. "It is not too late to start developing the infrastructures and implementing frameworks to promote EVs." This is not the first time Nepal has faced an Indian blockade. We didn’t learn from the 1988-89 embargo and it doesn’t look like we are learning from this one either. Nepalis will pay dearly for continued conflict in 2004. Activists launch campaign against military aid to Nepal. Nepals scholar-statesman Rishikesh Shaha died Thursday shortly after Deepak Thapa had visited him and written this tribute. We print this piece in the present tense to keep Shahas memory alive.